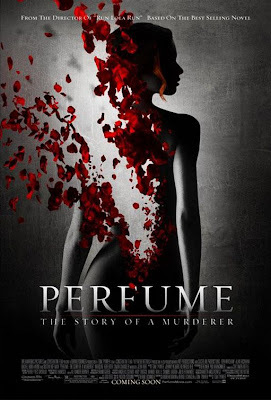 Perfume - Story of a Murderer or a Genius? 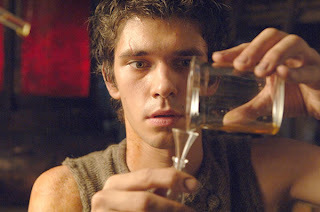 Perfume (2006) is a passable adaptation of Patrick Suskind's exceptional novel,"Perfume". The premise of the story is based on the notion that unknown to most people, it is scent, not physical beauty, that more powerfully attracts us to a particular person over another. It is scent (today, psychologists would say, pheromones) that spellbinds us and makes us warm to and feel an affinity towards others upon first meeting them. While Perfume is the story of a socially inept man, his crimes, his passion for the making of perfume and his unfortunate upbringing in the city of Paris, I think it is also a commentary on people in general. In this short review, I want to posit that we, unlike the main character Grenouille, are primitive. Throughout the story, we are given a portrait of Grenouille, the murderer. Yet who are we to label him a murderer given the fact that our olfactory sense remains in primitive stage and since as evidenced by the book's last passage, we lack control for the most important sense that partly governs our behaviour. You could make the mistake of watching this movie, believing, that after all, your senses will awaken more strongly to the sight of images on the big screen rather than to words in a book. You are wrong. If you watch "Perfume", you will not be transported to the stench of 18th century France, nor will you partake in Grenouille's supernatural olfactory gift. You will not experience his brutal, miserly upbringing, nor will you delight in his colorful journey towards the discovery of perfume making. You will fail to understand his drive to create a unique perfume even at the cost of murdering women, of murdering one virgin after another with no regard for life. In short, you will become like the bygone perfumer, Giuseppe Baldini. Watching this film would be like smelling and falling under the spell of "Amor and Psyche" and yet, failing to distinguish its individual components. Finally if you haven't read the book, you may even shun Suskind's evocative masterpiece. That would be a tragic loss. Why do I write this? I believe that the film is too prude, perhaps even naive, in its exploration of Grenouille's psyche. While reading the book, I remember feeling a mixture of pity, repulsion, dislike and much later, respect, for a genius that I could not understand and who, though socially amoral, still managed to inspire admiration for his talent and his personal integrity. In the film though, the main character's complexity is cheaply diluted. Grenouille is not portrayed with the same motivations and drive. The film's portrayal was almost comical rather than psychopathic. To compound the poor characterisation, is the annoying off screen narrator. I have not felt like this about a narrator since Oliver Stone's Alexander. With Perfume, every time I tried to lose myself in the sensory journey, here was the narrator, distracting me again, instructing me what Grenouille was supposedly thinking at every passing moment. This was frustrating and inaccurate considering that having read the book, I was aware of what Grenouille was supposed to be thinking and this differed significantly. So now comes the climax of my contention. It is the very final scene, in Paris, where the great perfumer makes a life changing decision after so many years of intense searching and self-discipline. That scene was pathetically staged. The long shot distances us from the carnage and doesn't make the powerful point it should. Why is this scene so important? In it, a group of vagrants, or dare I say the wretch of society is exposed to Grenouille's powerful perfume. It is the perfect perfume, as far as Grenouille is concerned. It is what has obsessed him for years. He douses himself with it and waits. What will be the people's reaction to this most powerful scent? After all, they are beggars and outcasts but hardly criminal...Their reaction? Well they eat him. The book's depiction evokes animalistic flesh eating, blood and orgiastic cannibalism. It brings the reader to a suspenseful, horrifying climax. As Grenouille is literally devoured, we the readers are invited to contrast the senseless behaviour of mere mortals under the effect of powerful scents, with that of a man who had to live with these very powerful scents all his life. The question raised in this crucial part of the book is whether we would not also be murderers if we could experience scents to the degree that Grenouille was able to experience them. Or would we be worse than murderers perhaps? This is why I think relatively speaking, this final scene was not dealt with very well in the film. It should have raised a question about our own primal instincts. It should make us realise that perhaps Grenouille is much more sophisticated than his earlier portrayal gave him credit for and that we are not.